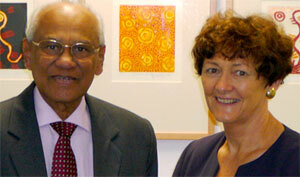 The High Commissioner of Sri Lanka, His Excellency Mr K Balapatabendi PC, recently visited Charles Darwin University and met with Vice-Chancellor Professor Helen Garnett. The Vice-Chancellor provided the High Commissioner with an overview of the University and explained that Charles Darwin University was a dual sector education provider with excellence in both higher education as well as vocational training and education. The High Commissioner expressed an interest in Sri Lankan graduates undertaking CDU’s Master of Engineering Management course, which is offered to engineers and professionals wishing to upgrade their managerial skills.